A tumour is a "lump" which may be benign or malignant (cancerous). Many different tumours may be found on the liver and investigating them is an important task which often requires specialist imaging. Usually a confident diagnosis can be made with ultrasound, CT or MRI scans. Occasionally a biopsy will be necessary (small sample of the tumour taken with a needle for microscopic analysis). Benign liver tumours are quite common and often noticed incidentally on scans performed for other reasons. Most benign liver tumours do not need treatment. Liver adenoma may need surgery due to their potential to progress to cancer or cause internal bleeding. Malignant (cancerous) tumours of the liver may be either primary (originating in the liver) or secondary (spread to the liver). 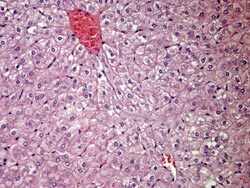 Primary liver cancer is known as hepatocellular carcinoma or hepatoma. 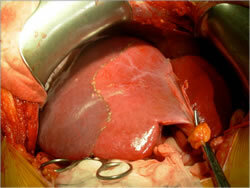 The majority of hepatoma develop in livers with underlying cirrhosis. There are many different treatment modalities for hepatoma including surgical resection, drug therapy, local ablation (burning) or liver transplantation. All hepatoma are discussed in a multidisciplinary meeting at the Austin with surgeons, hepatologists (liver specialists), oncologists and radiologists present. Secondary cancers in the liver are more common than primary and may have originated in many different organs. If bowel cancer spreads to the liver, surgery is often indicated. In rare circumstances other (non bowel) cancers which have spread to the liver may need surgery. All secondary liver cancers are discussed in a multidisciplinary meeting at the Austin with surgeons, oncologists, pathologists, nuclear physicians and radiologists present.